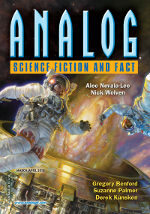 “Sun Splashed Fields and Far Blue Mountains” was first published in Analog Science Fiction and Fact, in the March/April issue, in 2018. Read a review by Kevin P. Hallett from Tangent Online here. “Nine hundred and twenty-five thousand dollars, above insurance.” The price, finally uttered, erased everything said before. The doctor’s mellow tones, his reassurances. Karen gripped Dave’s hand, and his gray face became grayer. Fine. Karen would sell the cars. Remortgage the house. Or they could move to a smaller place, maybe a basement suite. There were bonds, investments. She could pick up more hours tutoring after school, put off retirement, quit her volunteer work at the hospice and get summer jobs. Hell, she could work nights at the local Denny’s. She reached out and took Dave’s hand, her fingers cold, her grip hard and commanding. “We have to talk about it,” Karen was quick to interject. Dave glared at her, sidelong, jaw clamped, and she heard nothing as Dr. Campbell’s quiet voice continued from behind his desk. She was calculating. They had four thousand dollars in their savings account. They had their retirement savings and a line of credit. And they’d simply cut up the credit cards. “…bring you some coffee.” And the cherry door eased closed with a click. Karen spun in her chair, perching on the edge of the supple leather, and grasped both of Dave’s hands in her own. His lips, pressed closed over that tight jaw, quivered, but remained resolute. His fingers gripped hers just as hard, spilling love in their painful grasp. He couldn’t talk. She knew he couldn’t talk. He would not defend his position, just stick to it. But she couldn’t keep the words inside. “Money is only money.” She had to organize her arguments logically, make him see. “So we go without a few things. Go into debt. I cannot–I will not–” Her throat closed. “No. That’s the bottom line. He said it.” She jerked her head toward the polished door. Dave pulled one hand from hers to rub his nose and look out the window. The immense window. Under an over-height ceiling. In a cherrywood paneled office. She followed his gaze over the gray, silent bustle of the city below, to sun splashed fields and far blue mountains. Their Heaven. Their retirement, together, road trips and fishing and quiet mountain brooks. Slipping away into a hazy distance. His hand shook in hers, his grip tightening. She slipped from her chair to kneel by him, press her belly against his knee and slide her hand around his neck, rest her head against his shaking chest. There weren’t enough donated livers, not nearly enough. Hers was incompatible. His body wasn’t tolerating the medications he’d been given. And Dave had an something, maybe the result of the years he’d spent in the dye factory, that made organs printed from his own cells shrivel within weeks. Dave’s fist trembled in hers for a moment. Then he engulfed her with his other arm, laid his head on hers, puffing out a shuddered exhalation. Jessica’s heart went out to the woman in front of her. She’d met Karen a few times as she and her husband toured the facility, here in the countryside. Later, Karen had haunted the clinic and its quiet grounds during her husband’s tests. Jessica had liked her from their first meeting, sensing Karen had hidden strength. Now, though, Karen was here on her own, perched on the leather chair as though she would be changed forever if she allowed herself to sit properly in it. “You’re finding the financing difficult.” Jessica leaned forward, resting her hand across her desk, willing Karen to look up from her fingers, look up from worrying her purse in her lap. The flick of panic in the woman’s eyes confirmed she’d had no intention of hiring a nurse. Or, likely, of staying home from work to care for her husband. The woman breathed out, eyes fixed on hers, a shaky nod. Jessica didn’t know what the Stenners had done to “get the money,” but whatever it was, it twisted this woman inside out. Karen sniffed and Jessica gave her a tissue. The woman frowned as if calculating how much blood she would need to give to earn a million dollars. Surgery. Karen bit her knuckle, staring through the double glass doors at the immaculate grounds and wide driveway of the clinic, blurred now, with rain. A few more hours. Then Dave would be done. Karen sipped her coffee, her third, and the caffeine wasn’t helping. She’d fled the waiting room. The lounge was no better, though at least here, there was a human presence. A man at the far end watched television. A woman read a book. The long hand on the clock clicked from six minutes past three, to seven minutes past three. A young couple and their toddler came in from the corridor. They stopped at a chair near the rain-streaked door. “It’s not the money.” The woman held the sleeve of a duckling-yellow raincoat open as the man guided the little girl’s hand into it. Money. Karen wasn’t the only one obsessing about it. Here was a family that didn’t have the worries Karen did. Karen’s gaze snapped to the little girl. Heartbreakingly thin. Yellow cast to her skin. Pain-pinched eyes. An ache sprang up in Karen’s chest. The poor child. The poor parents. She watched the family go through the glass doors, the father opening a wide umbrella. By God, she and Dave were lucky. So lucky. Karen wished there was something she could do. Share her good fortune. The doors fell closed and the family blurred into the rain. “Hey.” Dave turned his head on the raised pillow and grasped Karen’s hand, a sleepy smile lighting his amazing face, bringing tears of joy and relief to hers. Fresh flowers scented the table in the bay window overlooking the gardens and pond. Afternoon sunshine slanted through the balcony doors to warm the tiles before the fire place. An extra bed, so Karen could stay over when she wasn’t at work, filled a nook on the other side of the ensuite. Dave chewed the inside of his lip. “It’ll be enough.” She wasn’t sure she believed it, and she knew Dave didn’t, but she had to say it anyway. “I worked the figures.” Fifteen times. More. Dave studied her face, calculating the implications. “Listen. I’ve got you, and that’s all I care about. She’ll make him come around.” And if she didn’t–what? Theft? Fraud? The day before Dave’s discharge, Karen met with Jessica and Dr. Campbell after work. The thrum of rush hour traffic, muted by triple-paned glass and velvet drapes, deepened the headache from the tension of her work day and the anxieties of the long night. At least the lighting was subtle, illuminating only the cherry table and its scatter of papers and water glasses. She felt brittle. Wasn’t the financier listening? “I read the brochure. You pay three hundred dollars for a pint of plasma.” Karen’s nails bit into her palms. But…eight thousand dollars a month? That was far more than she brought home, teaching. More than Dave’s pension. Jessica’s gaze flicked to Dr. Campbell. Karen’s skin prickled with disappointment. She didn’t want there to be a catch. “Like those pesticide test subjects in the sixties?” she asked bitterly. “And, why this program’s not on your brochure,” Karen said. The secrecy made sense. At least now, Jessica was being open and honest, which Karen appreciated. Karen didn’t tell Dave about the blood collection program right away. He felt good, and the hospital staff served them both dinner at the table in the bay window overlooking the pond. He was worried about their finances, she could tell, but he didn’t talk about it, and the sunset was so lovely she didn’t want to bring up money. They sat, long after the meal was done, fingers intertwined, silent with gratitude for the prospect of a long life together. Whatever the fine print in the contract said, Karen thanked God for Dr. Campbell’s clinic; Dave was one part of her life she would never lose. Later, they snuggled together on his bed watching T.V., and then the nurse came with his sleeping pill. They slept together all night on his tall, skinny bed with the sides up, like two spoons in a drawer. In the morning, the nurses woke them early and technicians came to draw Dave’s blood. Dr. Campbell had to examine him, and Jessica was waiting for Karen in her office. “Mrs. Stenner.” Jessica stood in the doorway to her office. “Yes. Sorry.” She found her way into the conference room. Today, the drapes were open and cheery sunlight poured through the windows. “Did you have any questions about the procedure?” Jessica asked, once Karen had taken a seat. A pen lay on the table. “Five.” Jessica eased herself into her chair. A crease formed between Jessica’s brows. “How careful?” She envisioned herself and Dave in their RV. Karen’s hand hesitated over the contract. But–Dave. The money. Her sister. And Linsy. Not only could Karen help her own situation, but she could help so many others. A clench of certainty wrapped icy fingers around Karen’s heart, and her skin flashed cold. There was no choice. “No. I’ll sign.” She scratched a quick scribble. She blinked in the dim light. The beige curtains of her familiar cubicle surrounded her. The musty, antiseptic smell returned. She nodded and closed her eyes, still tired, still gripping his thumb. The clinic was a vast, shadowy space infused by the silence of humming machines. She shook her head, not following. Sleep rose up around her again. The urgency in his voice brought her awake. But she could not keep her eyes open. And that day, that beautiful day, waited for her in sleep. She struggled to bring him into focus, to bring the meaning of his words home. Something…something was sad, not right. Something she’d done. She reached out a leaden hand. I love you, she wanted to say, but the words would not form on her tongue. And then…the thought was gone. She rolled over. Dave was all right. He was well. That was what mattered. “I go to bed every night without you. Karen, I’m alone–” His fingers tightened on hers, hurting. But Linsy was saved. Wasn’t she? Karen felt good about that. And, so many others. Karen let her eyes drift closed. The sun splashed fields waited for her. She, too, would be all right.